NStar’s Walk for Children’s Hospital is almost here—help Anthony reach his goal! Anthony Lamacchia is participating in the Walk for Children’s Hospital this year. The Walk for Children’s Hospital in Boston helps fund programs for sick children to make them better and it also helps maintain the facilities where it happens. The 7-mile walk starts at 11 AM on Sunday, June 9 at the DCR Hatch Shell and goes along the Charles River. The 2-mile walk starts at noon. Anthony has done the Walk many times since 2000 and the last two years in a row. He has raised thousands of dollars for this event which has special meaning for him. 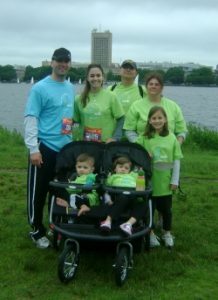 Anthony has created a team page with his family and hopes to beat his goal of $5,000 this year. Simply visit Team Heather’s Giving Page to make a donation. Feel free to share this link with friends, family, and co-workers. Your donation gives sick kids a chance to get better! Boston Children’s Hospital, Harvard Medical School’s primary pediatric teaching hospital, is a leading source of life-saving care and ground-breaking research for children in New England and worldwide. For more information go to www.childrenshospital.org.